Calling musicians and singers aged 10-25! Brighton Dome is hosting a special fundraising event for encore and Brighton Dome & Brighton Festival, supporting the next generation of musical talent in Brighton & Hove. Musicians and singers aged 10-25 will need to register before Mon 17 Sep to take part in the Music Marathon (Sat 17 Nov): performers will be free to play or sing whatever they like… as long as it's suitable for a family audience! ​Over 4,000 young people of all abilities are taught by Brighton & Hove Music & Arts (BHMA) each week in every Brighton & Hove schools, and encore is the fundraising network for all the young musicians supported by BHMA. Brighton Dome & Brighton Festival teamed-up with BHMA in July 2017, and together they provide music and arts education, performance and touring opportunities for children and young people city-wide. 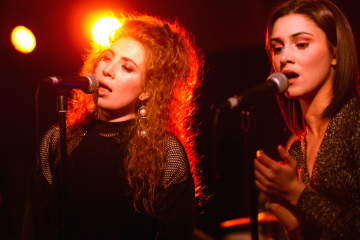 "There's a powerful message in young musicians and singers who've received support publicly fundraising to ensure the next generation can have the same opportunities. "We want this event to be accessible to musicians, singers and music producers and will welcome any genre, so performers can be solo or part of a group and acoustic or amplified (as long as they can plug into a basic backline and play with no sound check!). "For performers, this is a great opportunity to play or sing at Brighton Dome (after all, you never know who's watching) and to be involved in what we hope will be a really dynamic event. "Our 8-hour marathon is made up of lots of performers each playing short slots back to back. "The idea is that they are literally queuing up to perform and handing straight from one to the next. It should create a fast-paced, exciting and surprising musical mix." Music Marathon is supported by The Pebble Trust and BIMM Brighton.